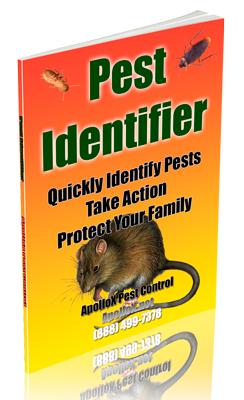 ApolloX Pest Control will remove moles from around your home quickly, efficiently, and safely. Moles have cylindrical bodies with slender, pointed snouts and short, bare, or sparsely haired tails. Their limbs are short and spadelike. Their eyes are poorly developed, and their ears aren’t visible. The fur is short, dense, and velvety. Moles are 4”-8” long from nose to tail and have short, powerful front feet with large claws for digging. 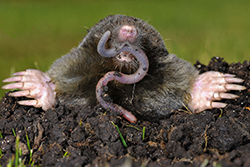 Moles live underground in areas of moist, sandy loam soils where digging is easy so that they can create a vast network of interconnecting tunnels. They frequently create shallow tunnels just below the surface where they capture worms, insects, and other invertebrates. Moles can tunnel up to 150 ft. per day. Surface feeding burrows appear as ridges that the mole pushes up by forcing its way through the soil. Some of the surface runways are temporary. More permanent tunnels are deeper underground and are usually about 2 inches in diameter and 8 to 12 inches below the surface. 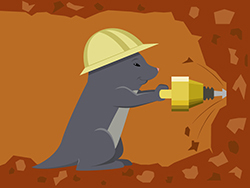 Greatest mole activity occurs usually after rainfall or watering events when digging new tunnels is easiest. Moles typically have one litter of three to four young per year. Because moles are antisocial, you will find only one mole per tunnel, except during the breeding season, which typically occurs during later winter through early spring. Moles may infrequently consume roots, bulbs, and other plant material, although rodent species (e.g., pocket gophers, meadow voles, and deer mice) are almost always the cause of such chewing damage. By far the greatest damage from moles occurs through their burrowing activity, which dislodges plants and dries out their roots. In lawns, the resulting mounds and ridges are unsightly and disfiguring. 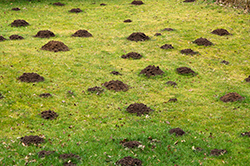 Because mole damage can be unsightly, makes lawn maintenance difficult, and destroys valuable plants, the number of moles that can be tolerated is usually quite low, sometimes even zero. As soon as you see an active mound or surface runway, initiate appropriate control actions. Once you have controlled damage, establish a system to monitor for re-infestation. Several methods of control are available, but no single method has proven fail-proof, so it may be necessary to use a combination of techniques. 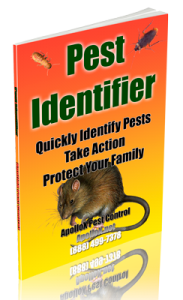 Call ApolloX Pest Control for moles pest control in the Fairfield County CT towns of Fairfield, Black Rock, Bridgeport, Cos Cob, Darien, Easton, Greenfield Hill, Greenwich, New Canaan, Noroton, North Stamford, Norwalk, Old Greenwich, Redding (lower), Ridgefield (lower), Riverside, Rowayton, Shelton, Southport, Stamford, Stratford, Trumbull, Weston, Westport & Wilton.